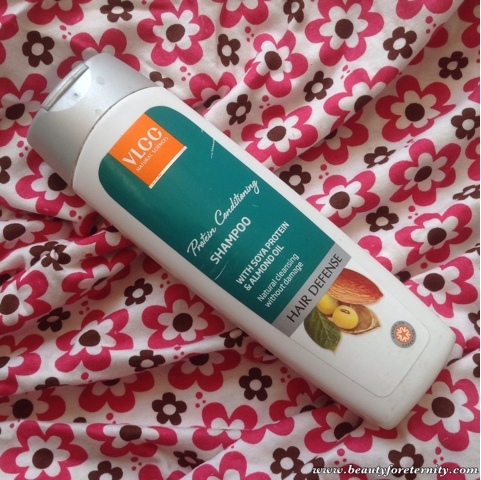 Today's post is a product review post in which I am going to review a shampoo from VLCC. The name of the shampoo is "VLCC Protein Conditioning Shampoo". Available at: nykaa.com and departmental stores etc. 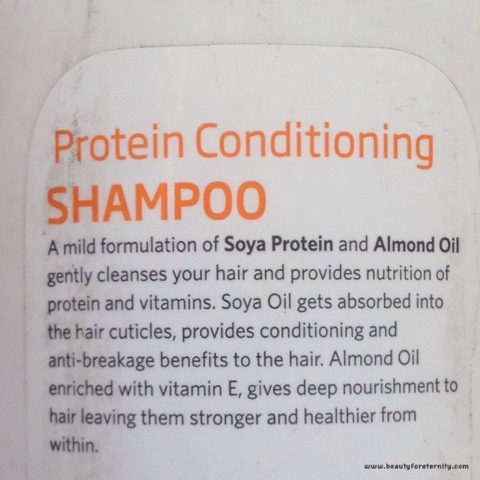 Product Claims: VLCC Protein Conditioning Shampoo claims to be a mild formulation of Soya Praotein and Almond Oil which gently cleanses the hair and provides the nutrition of proteins and vitamins. Soya Oil gets absorbed quickly by the hair cuticle and provides conditioning and anti-breakage benefits to the hair whereas Almond Oil being rich in vitamin E, gives deep nourishment to hair leaving them stronger and healthier from within. 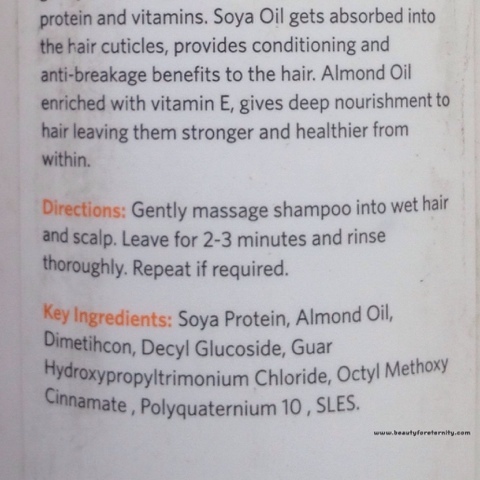 I was happy to see Soya Protein and Almond Oil in the ingredients but SLES made me little sad because it's little harsh on the hair. Packaging: VLCC Protien conditioning shampoo comes in an off white plastic bottle which has a silver grey flip cap. The cap is secure and closes tightly without allowing any product leakage. The packaging is simple, sturdy and travel-friendly. Fragrance: VLCC shampoo has extremely mild fragrance. I personally like my hair to smell really nice and fresh and that's why I like when my shampoo has strong and pleasant smell. It's more suitable for people with sensitive noses. The off white coloured shampoo from VLCC has medium consistency which is neither too runny nor too thick. It spreads nicely on my palms as well as my hair and develops a rich lather. I need to use it twice for thorough cleaning of my medium length and medium thickness hair. It rinses off easily and leaves my hair quite manageable and soft. For most of the times, I used it on my dry hair and applied no conditioner afterwards and it still left my hair frizz free and shiny. My hair never felt too dry despite of using this shampoo without any pre-shampoo oiling or post-shampoo conditioning which was quite surprising. I also noticed that my hair were tangle free and more manageable post washing with this shampoo. The best part about this shampoo is that it kept my scalp oil free for 4-5 days which usually gets oily on the third day and I can't resist washing my hair. However while using this shampoo, I could easily spend 4-5 days without taking head-bath. I did not see any hairfall while using this shampoo. That might be because it's a conditioning shampoo and leaves the hair tangle free so less hair breakage occurs during combing and hair styling. I don't wash my hair everyday so I can't comment whether it's gentle enough to be used on daily basis. However if you wash your hair 2-3 times a week then it does no harm and lives upto the expectations you may have. Overall, it is an affordable shampoo which cleanses the hair thoroughly yet gently, controls frizz, makes the hair more shiny, manageable and keeps them oil-free for good 4-5 days. It's also effective in controlling the hair fall. Yes, go for it because it does work and all the claims made by the company are correct about this shampoo. I highly recommend it and will definitely repurchase it because it has got everything that I look for in a shampoo.